Click here to see a PDF of this recipe without photos. In the book, Keller includes a number of “lightbulb moments,” almost all of which are great kitchen tips. Along with this recipe, he writes “the first lightbulb moment I want to offer is one I was lucky to realize in time, and hope that others will too. It may seem obvious but it’s worth repeating: Take care of your parents.” Hear, hear, Chef. Make the shortcakes – Preheat oven to 425 degrees. In a food processor, pulse together flour, 3 Tb sugar, baking powder and salt. Add butter and pulse until the mixture resembles coarse crumbs. Put mixture into a large mixing bowl. In a separate bowl, beat 1 egg with the half-and-half or milk. Pour into the dry ingredients and mix with a rubber spatula. When mixed, turn onto a lightly floured work surface and bring together with your hands. Pat down until the dough is about 1 inch thick, then cut rounds with a 2 ¾ inch biscuit cutter. Place rounds on a baking sheet lined with parchment paper (about 2 inches apart). (You can stop here, cover with plastic, and refrigerate for several hours, or you can move directly to the next step.) Lightly beat the egg white, then brush the top of each round. Sprinkle with the remaining sugar, then bake 12 -14 minutes. Allow to cook for at least several minutes before serving. Prepare the fruit – mash just less than half of the strawberries with a potato masher in a large bowl. Slice the remaining strawberries and add to the bowl along with the sugar. Allow to sit at room temperature for at least 30 minutes, then move to the fridge until you’re ready to serve. When you’re ready, cut open a shortcake, spoon some strawberries onto the bottom, then add whipped cream, then add the top of the shortcake. Prep – Place the chicken on a plate and season all sides with salt and pepper. Place skin side up and set in fridge uncovered for a couple of hours. Cut the thicker stems out of the collards. Cut the remaining leaves into 2” – 3” strips. Wash and dry (with a salad spinner). Cooking the potatoes – about 1:40 before mealtime – place potatoes in a large pot with salted water. Bring to a boil. Simmer for about 30 minutes or until tender. About 1 hour before mealtime, drain and place in a bowl until cool enough to handle. Peel, then run through a potato ricer into the pot. Add the butter and cream plus salt and pepper. Stir to combine, then cover. If you need to rewarm before eating, you can do so over medium heat, also adding some more butter. Cooking the chicken – at least two hours before mealtime, place chicken on the counter to allow to come to room temperature. Heat the grill to around 350 degrees. About 40 minutes before mealtime, place on the grill, skin side down. After about 15 minutes, flip. Cook until the internal temperature reaches 160 degrees. Baste with BBQ sauce (just before removing from grill), then move to a tray. Tent with foil and allow to rest about 10 minutes before serving. 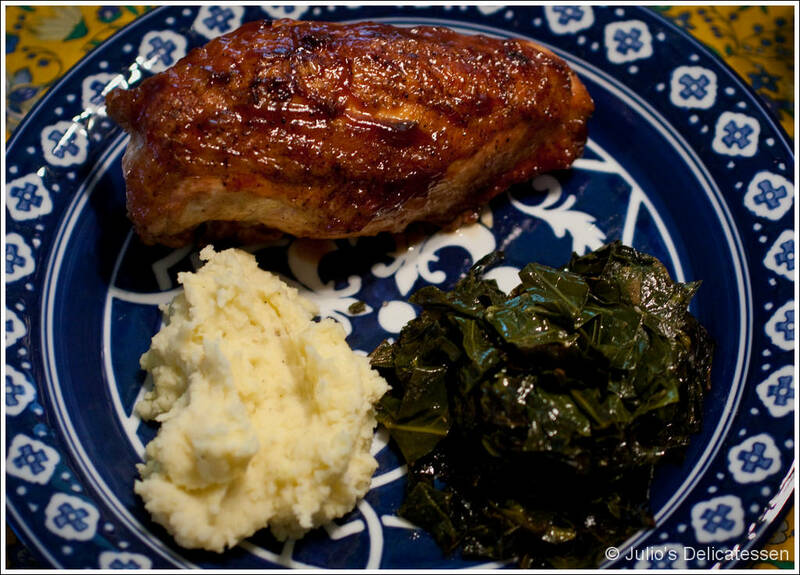 Cooking the collards – About 1:20 before mealtime, preheat oven to 325 degrees. Render bacon fat in a dutch oven. Remove bacon, leaving behind all the fat. Add the butter, then the collards. Use tongs to toss the collards and ensure they are evenly covered with the fat. They will also begin to wilt. Add salt, cover tightly, and move to the oven. After about 45 minutes, turn off the heat (but leave in the oven to finish cooking).